An infrared sauna kit is perfect for installation at home. These infrared saunas are compact, beautiful and powerful. They provide sufficient health and detox benefits and the products feature a range of practical advantages. Kits are made for easy assembly and placement in the smallest of homes. The quality of the heater, the material that the sauna is made of, the construction and the extras all have to be examined before making a purchase. Here are some of the best home infrared sauna kits that come with an optimal price to quality ratio. JNH Lifestyle saunas are known for the quality of the construction and the use of powerful carbon fiber heaters. 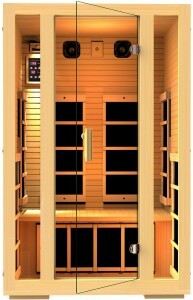 The JNH Lifestyle 2 Person Far Infrared Sauna is no exception. It features seven carbon fiber heating panels that ensure the even distribution of heat throughout the sauna. They reach the desired temperature quickly and they’re gentle than the less expensive and less innovative ceramic heaters. The sauna kit is manufactured for quick and easy assembly. Some people that purchased the product required less than 30 minutes to put the sauna together. Its body is made of green wood certified Canadian hemlock timber. No chemicals or plywood are used in creating the kit, which contributes to an environment-friendly and 100 percent healthy experience. Heat can be varied in a range of up to 140 degrees Fahrenheit. 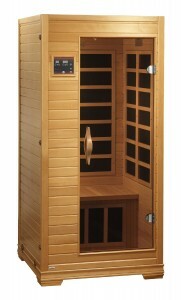 The sauna features easy and convenient controls that simplify adjustments. A few extra features are also available. JNH Lifestyle 2 Person Far Infrared Sauna comes with two built-in speakers that can be paired with just about any audio device. Listening to music while enjoying the therapeutic heat will make the experience even more relaxing. This is another far infrared sauna kit that’s characterized by incredibly easy assembly and quality construction. BetterLife BL6109 measures 40 by 36 by 77 inches but the interior is comfortable enough for two people. The sauna weighs 280 pounds. The sauna is equipped with eight carbon fiber heating elements. There’s a floor mat and a heater located underneath the bench, ensuring therapeutic benefits that affect the entire body of the user. Apart from using therapeutic infrared heat, the sauna also features chromotherapy lights. Chromotherapy is also known as light therapy. According to several theories, the use of lights in different colors can have a positive impact on the treatment of individuals suffering from various medical conditions. BetterLife BL6109 has speakers that can be paired with just about every device, LED lights and a reading light. Controls are available both inside the sauna and on its exterior to make adjustments easier. The 4 person infrared sauna kit by Heat Wave is a lot more spacious than the other entries in the list but just like them, it’s easy to assemble and start using immediately. The sauna measures 70 by 48 by 76 inches and its weight is 470 pounds. Solid hemlock wood is used in the sauna’s construction. Each of the panels comes with a tongue and groove design that makes it possible to assemble the kit without the use of tools. There are nine carbon fiber heaters positioned strategically in the sauna to ensure the even distribution of heat. One large heater is placed on the back wall, there are two additional ones on the side walls, two on the floor and one directly in front of every bench. The sauna operates at temperatures of up to 140 degrees Fahrenheit. Dual use exterior and interior LED control panels are available for easier use. Just like the BestLife sauna, this product comes with therapeutic colored light bulbs. Either rotating colors or a steady stream of six colors can be chosen. Apart from these characteristics, the Heat Wave infrared sauna kit has a CD player, a standard AM/FM radio and mp3 connectivity. The sauna can be paired with just about every device to ensure music streaming. Built-in speakers guarantee the audio quality.